There is something about Mohammed Rafi that appeals to me, even when I was only in my teens when he died. 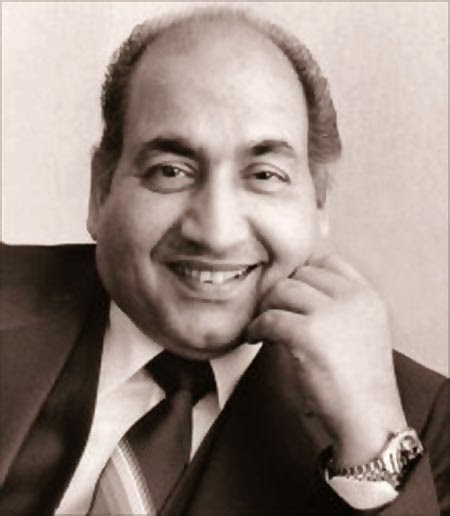 Perhaps it is because the more I read about Mohammed Rafi, the more it seemed that here was a man who, his great talent notwithstanding, was humble, generous, and down-to-earth. He didn't play games, was too nice to be manipulative, and had only two constants in life - namaaz and riyaaz (according to music director, Naushad). It is nice to know that there are certain idols who do not have feet of clay. Perhaps it is the fact that I have never seen a photograph of him where he is not smiling. A fact verified by Sanjay Kohli (Madan Mohan's son) in an interview where he stated that while he was heading a recording company and they wanted to release a selection of Mohammed Rafi's sad songs, they couldn't find a single photograph of the singer where he looked solemn. Mahendra Kapoor, Rafi's junior, and self-acknowledged 'disciple', was completely taken aback by the graciousness shown to him by the well-established singer. 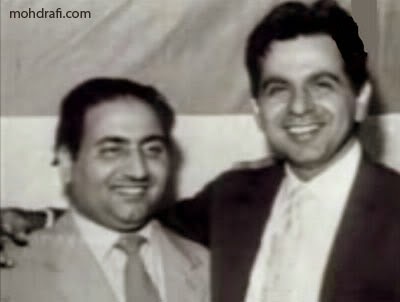 In an interview with Rediff.com a couple of years ago, Ruhan Kapoor, Mahendra Kapoor's son, narrates how whenever his father had to sing in a college competition, Mohammed Rafi would insist upon listening to the chosen song on the phone; if Mahendra Kapoor did not sing it well, Rafi would go to their house and teach him to sing it correctly. He would then sit at Mahendra Kapoor's mother's feet and happily gulp down puris and lassi. As Lata Mangeshkar says, "He was very fond of two things - singing, and eating." The anecdotes about this gentle man are numerous, each demonstrating his child-like simplicity or his generosity, or his humility and graciousness. I could continue to collate all the anecdotes I have read / heard about this legendary singer, or I can proceed to try and choose a selection of his duets, which is what this post is about. Now, considering that choosing a set number of solos was fraught with such turmoil, how much more trouble is it to sift through his many duets to compose a representative list? As in the post about Manna Dey, the problem was less what to choose, than what to leave out. When a 'short-list' runs into tens of songs, you know you have a problem. And they are all songs that I love. So, deciding that this is one of those felicitous moments in life when there are no 'wrong' answers, I decided to pick the songs based on my mood of the moment. I did try to keep it (as much as I could) to different music directors as well as co-singers. Hence, this list is completely subjective (as are all my lists) and though the songs will always number amongst my favourites, 'my 'favourites of the moment' can absolutely change at a moment's notice. 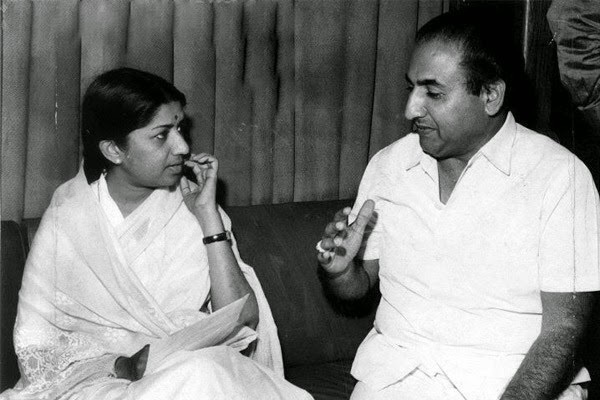 At the height of their careers, the combination of Mohammed Rafi and Lata Mangeshkar was as close to perfection as you could find - a female vocalist who never dropped a note, and a male vocalist who was not stereotyped into being any one actor's voice, and whose vast range and versatility spanned disparate genres with ease. I love the absolute sweetness of both their voices in this song from Aansoo, each complementing the other, caressing the notes so languorously, as if they (the characters) had all the time in the world to savour their love for each other. 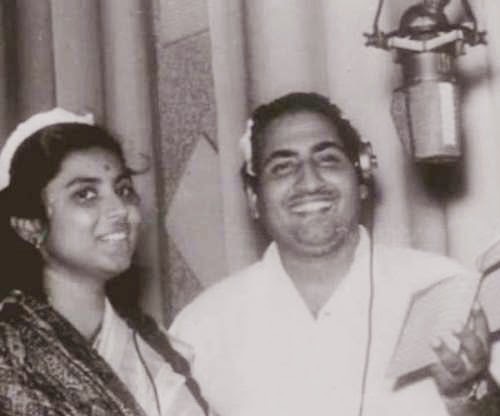 My second choice for a Rafi-Lata duet was Tasveer teri dil mein from Maya (1961) Majrooh Sultanpuri's lyrics set to Salil Choudhary's music, this duet is, like most of Salilda's compositions, not as easy to sing as it sounds. I must confess to liking Mohammed Rafi's part of the duet more than I like Lata Mangeshkar's, but it is still one of their best duets. 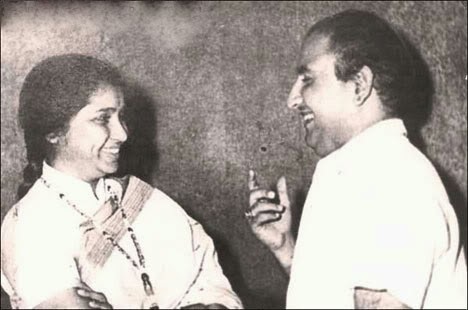 Lata Mangeshkar was a perfect foil to Mohammed Rafi, but sister Asha Bhosle had the felicity of singing some wonderful duets with him as well. Notably under OP Nayyar's baton, since Nayyar made extensive use of both singers. Why did I choose Nazneen bada rangeen hai vaada tera? For one, because it was my husband's choice. That apart, it is one of my favourite Rafi duets - I love the way Mohammed Rafi begins this song, slowly enunciating each word, so full of love. Asha follows suit, and then the tempo changes, and so does the mood - still full of love, but playful now, and slightly flirtatious... lovely! Asha is on record as stating that Kishore Kumar is her favourite singer, and favourite co-singer, and there is no doubt that she sang some wonderful duets with him. Their camaraderie was evident, but she had immense respect for Mohammed Rafi as well. She once stated that his "greatest ability was that he could sing at a high pitch and shift to a low pitch immediately." (I'm not providing attribution since this statement is mentioned in quite a few places, and it is not very clear just where, when or to whom she said this.) I did have Ek chameli ke mandve tale from Cha Cha Cha (1964), written by Makhdoom Moinuddin and set to music by Iqbal Quereshi, on my list as well. (Which song Quereshi recycled from his Aaj mausam ki masti mein gaaye pawan from Banarasi Thug (1962). But Nazneen bada rangeen hai vaada tera won hands down. That I love Mohammed Rafi is in no doubt at all, but one of my favourite female singers is Geeta Dutt, and together, they are responsible for some of the best songs in Hindi film music. Since Geeta Dutt is known (and quite unfairly stereotyped) as a singer of sad songs, I decided to choose a fun, frothy number as my selection for their duets. The choice lay between two songs picturised on Johnny Walker, both from Guru Dutt films (one as producer/director and the other as actor). I eventually chose Arre na na na na na na tauba tauba because there is such joy in Geeta Dutt's voice, that it is impossible to listen to it and not smile. (My other choice was Dekh idhar ae haseena from 12 o'Clock, (1958) by the same lyricist/composer duo). The song is also interesting because of the actors on whom it was picturised - Noor and Johnny Walker. Noor, who was actress Shakila's (Shakila was one of the leads in Aar Paar) sister met Johnny Walker on the sets of this film; they fell in love and married soon after. According to Hindi film music lore, Yahan badla wafa ka was supposed to be sung by Noor Jehan and GM Durrani. It was Noor Jehan who recommended Mohammed Rafi to the music director. I do not know if that is true, but it is true that the lyricist Tanveer Naqvi introduced the young lad to many a film producer and music director. Considering that Naqvi (real name: Syed Khursheed Ali) eventually married Noor Jehan's elder sister, Eiden Bai, it is not without merit that Noor Jehan may have recommended the young singer to her husband. Be that as it may, this song played an important role in Mohammed Rafi's career (it was his first 'hit' song), as it did that of the leads, especially Dilip Kumar, whose career received a fillip when Jugnu became a runaway success. *The lyricist's name is also mentioned as Azir Sarhadi on giitaayan. Though contemporaries, Shamshad Begum was already an established singer around the time Mohammed Rafi was still seeking for a firm foothold in the industry. (They both began their careers around 1941 or so, both came to India in 1944.) That would soon change, and Rafi would establish himself as one of the greatest voices of the age, while Shamshad Begum would find her career derailed by the blitzkrieg that was Lata Mangeshkar. Still, when Mohammed Rafi sang La de mohe balma aasmani choodiyan with Shamshad Begum in Rail ka Dibba in 1953, he was astounded to find himself completely outclassed by his senior colleague - she manages 8-10 lines at double the tempo - without pausing for a single breath - while Rafi, when it was his turn to do the same is forced to take a breath in between. In an interview, Shamshad Begum recollected how Rafi needed five takes to get that song right, and at the end, came to her and said, "Aapaaji, maan gaye aapko." That is not the case in this song however. Bheega bheega pyar ka sama has made its appearance on my blog before, but I love the sweetness of its lyrics and composition, and while many songs appear and disappear on my 'favourites' list, this one has made a perennial place for itself. (I do wish that Bharat Bhushan and Ameeta would at least pretend to move along with the movement of the tanga in order to complement the song better.) 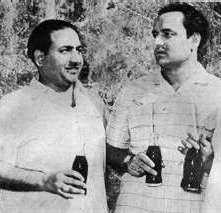 My second choice for a Rafi-Shamshad duet (they sang around 106 duets together) was Solah baras ki bhayee umariya from Aag (1948), with lyrics by Majrooh Sultanpuri, and music by Ram Ganguly. I love it as much for the music and lyrics and singing, as I do for its picturisation. Suraiya had gone on record stating her apprehension of, and discomfort with western tunes, so this song comes as a pleasant surprise. Besides, this was the only film in which Raj Kapoor and Suraiya acted together - they were childhood friends, and he, along with Madan Mohan, could credibly claim that they were responsible for her success. They had encouraged her to take part in a children's programme on All India Radio; music director Naushad heard her, and impressed with her voice, gave her a chance to sing under his baton. The film was Station Master (1942). Raj Kapoor teasingly called her 'Kallu' and their camaraderie is easily visible in this song. My second choice for a Rafi-Suraiya duet was the plaintive, romantic, Beqarar sa koi from Shama Parwana. It even had a young and very handsome Shammi Kapoor but, well, he was dropped in favour of his older brother. Lata Mangeshkar's falling out with Mohammed Rafi over the royalty issue would spur this young singer's career. Her voice has the sweetness of Lata's, and without that break in the senior duo's professional relationship (Lata refused to sing with Rafi), may have stagnated as a Lata-wannabe. As it was, Mohammed Rafi forged a wonderful professional relationship with her, and Suman Kalyanpur and he notched several hits together. Parbaton ke pedon par is a particular favourite. The film didn't deserve Khayyam's wonderful compositions (including, but not limited to Tum apna ranj-o-gham and Bujha diye hain) in my opinion, but it is always nice to see one of my favourite actresses onscreen. Sahir's lyrics were, unlike his usually bitter and cynical verses, suitably romantic enough for cupid to strike the lead pair. (Waheeda Rehman would go on to marry her co-star ten years after this film.) 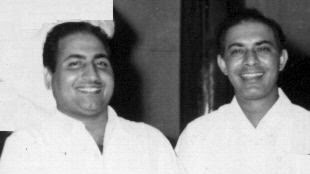 My second choice for this singer duo's collaboration was the cheery, frothy (what else do you expect with Shammi Kapoor?) Aaj kal tere mere pyar ke charche from Brahmchari (1968), with lyrics by Shailendra, and set to music by Shankar-Jaikishen. Talk about the golden age! This was a time when it wasn't only the heavyweights in the industry who were composing great tunes. There were many relatively unknown composers who gave wonderful music for perhaps a handful of films before fading away into obscurity, regardless of the fate of the songs or the films. Now this film itself is shrouded in mystery. Any attempt to get any information on a film called Sushila led nowhere. However, zealous digging led to another unheard of (at least to me) film called Subah Zaroor Aayegi, which appears to have been released in 1977. The cast and crew of the 1977 film, as well as the songs attributed to the latter, are strangely similar. I cannot help but wonder whether they were in fact, one and the same, just released under a different name. (Also, the refrain of Gham ki andheri raat mein is Subah zaroor aayegi, Subah ka intezaar kar. Two plus two, anyone?) Any information from my readers would be helpful. Gham ki andheri raat mein must also have been one of Talat Mahmood's last songs - the vagaries of fate led to his career fading away much before that of his contemporaries. In fact, by 1968, one of his songs for Aadmi (coincidentally, another duet with Mohammed Rafi), Kaisi haseen aaj bahaaron ki raat hain, was re-recorded in the voice of Mahendra Kapoor, leading to a controversy. Two legendary singers, two wonderful if different voices, together and separately, they have given us hours and hours of listening pleasure. This song particularly, is a joy to watch, and to hear, both singers employing vocal calisthenics in a jovial attempt to keep up with the picturisation. I can only imagine that they had great fun recording this song. Mohammed Rafi sings playback for Dharmendra, while Kishore does the needful for Amitabh Bachchan. 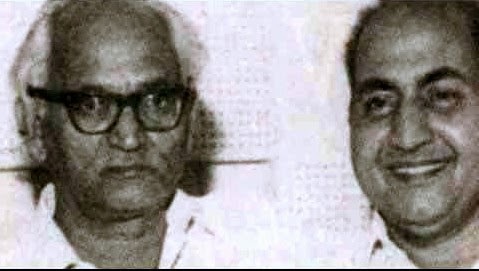 Two incredibly gifted singers who have both made a permanent place for themselves in the annals of Hindi film music, they notched up 101 songs together, 58 of which were duets. (I think this is the highest number of duets that Rafisaab sang with another male singer.) Why did I choose this frothy number instead of a more classical one? Because it is so full of joie de vivre that it never fails to make me smile. And also because it is a joy to watch Raj Kapoor and Mehmood dance with manic energy on screen. Manna Dey was effusive in his praise of his contemporary; in several interviews, he has reiterated that "He (Mohammed Rafi) was a better singer than me, and I will say this - that no one came even close to him! He deserved everything he got! We had a great understanding and it was never about one-upmanship." And it is so true in this duet, where the singers riff off each other, just as Raj Kapoor and Mehmood complement each other so well on screen. If I hadn't made such stringent rules for myself (of having only 'pure' duets), I think I would have put in Hoke majboor mujhe from Haqeeqat (Music: Madan Mohan, Lyrics: Kaifi Azmi). A stirring song that talks of the experiences of the soldiers and their families, Madan Mohan utilised the vocal talents of Bhupinder, Mohammed Rafi, Talat Mahmood and Manna Dey. In an interview (The Hindustan Times), Manna Dey recalled how, when he was recording the lines Zulf zid karke, he saw Rafi's eyes well up. That, he recollects, inspired him to give an additional touch of melancholy to the lines. 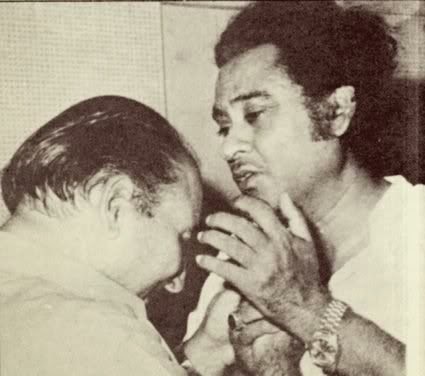 When the recording was over, Mohammed Rafi hugged him, saying, "Mannada, lajawab!" Such was the mutual respect between the greats that Mohammed Rafi is on record as telling assembled journalists, 'You listen to my songs; I only listen to Manna Dey songs." Years after Sangam, Raj Kapoor reunited on screen with friend Rajendra Kumar to play two bumbling middle-aged detectives on the trail of a kidnapped millionaire's daughter. Of course, they rescue the wrong girl, with grave (and hilarious) consequences. The film also starred singer Shailendra Singh who, like predecessors Mukesh and Talat Mahmood, was bitten by the acting bug. Mukesh sang for Raj Kapoor, obviously, while Mohammed Rafi provided playback once again for Rajendra Kumar. It is a simple tune, but an infectious one, nevertheless, and once again, the singers seem to be having as much fun as the actors depict on screen. The fact that it was a relatively obscure film (Who was going to watch Raj Kapoor and Rajendra Kumar as 'heroes' in the 70s? With a new hero and heroine who were both not 'star' material either?) meant that this song only makes an one-off appearance on the Mohammed Rafi and Mukesh fan blogs. The next two songs definitely aren't among the greatest of Mohammed Rafi's duets - musically, or otherwise. But they are funny to watch, and quite different from the usual Rafi duets wer are used to, and I list them here only for their value in representing singers other than the usual suspects. The song is picturised on Yaqub and Gope. The lyrics by Rajinder Krishan are a hoot, and the singers play their part in emphasising the comedy in the situation by the droll way they sing the song. If we hadn't been diverted by thoughts of a beloved, and the necessity to sing songs on our way to the moon, Indians may have landed men on the moon long before the Americans did! Alas, we weren't that focused. These are but a handful of duets that Mohammed Rafi sang with some of the biggest and brightest stars that lit up the skies of Hindi film music. Besides these, he has also notched up duets with Mubarak Begum, GM Durrani, Ameerbai Karnataki, Kamal Barot, Bhupinder, Krishna Rao Chhonkar, Sushma Shreshta, Sulochana Kadam, amongst others. Whether Mohammed Rafi is your favourite singer or not, there is no denying that he has quietly, as was his wont, made a place for himself in the world of Hindi film songs. When posterity looks back upon that golden era, his name will shine forth, not just as a great singer, but a genuinely humble and likeable personality, admired and respected by his peers, and beloved of all who appreciate good music. Shalini, in her comment on Rafi's solos, suggested that I make separate posts of Rafi's duets - with Lata, Asha and Geeta respectively. It is a tempting thought. :) I will, one day. But in the meantime, what are your favourite Mohammed Rafi duets? For anyone who is interested, here is the playlist with all my choices. choose, we can never can wrong, right? Madhu, I thought it was Daisy; and then, suddenly, I was struck by doubts. :) *Ram Avatar! * Of course! I couldn't, for the life of me, remember his name, and I knewRafi was so prolific, and so very versatile, wasn't he - he could make his voice act. That is it, in a nutshell! I love all the songs you listed. :) So, so, many lovely songs, I'm glad we have such a cornucopia of music, aren't you? Let me just link those. Ashraf, so, so right about never going wrong with our choices for Rafi or Lata in this period. But yes, I do have to get started soon on Shalini's suggestion - Dustedoff's choices below made me realise just how many Rafi-Asha and Rafi-Geeta duets, for instance, I really like! Thanks for the link - it is Bhagwan alright, but neither of the women are Mumtaz. She is the heroine, I think. This has to be the comic side plot. I have seen the woman in the navvari before; just cannot recollect her name. I don't think I have seen the other woman at all. Perhaps one of my readers can identify them for us. and one never gets tired of listening to his songs. 8 duets with female singers and another 6 duets with male singers. A wonderful bouquet of varied hues. On a couple of occasions I liked your second preference choice more. Songs #8 and #9 were new to me. I believe Asha Bhosle must have sung more duets with Md.Rafi than Lata Mangeshkar. And I think Shamsad Begum and Suman Kalyanpur must have rendered more than 100 duets and I am not sure how many duets Geeta Dutt sang with Md.Rafi. I guess it must be very close to the numbers of Shamsad Begum and Suman Kalyanpur. Besides the names you have mentioned, Aarati Mukherjee rendered a few duets with Md.Rafi. Here is a sprightly number, I am sure you will like it. Thank you once again for the wonderful post. Ah. That is what happens when I watch the song for the first three minutes and then switch to another tab, so it is only playing in the background! :) Yes, Mumtaz is beautiful, and she is with Dara Singh, who plays the hero, I think. She probably did the maximum number of films with him. Quite a few, I would say, where Rafi sang only the mukhda. But to say that he made them hits, is taking away from the talent of the composer and the accompanying singer, is it not? But both of the songs you have listed are wonderful to listen to. Gosh, I went there and read his diatribe. What a rude person. In any case, why should you like Baharon phool barsao even if it is the most popular song for every decade? (For what it is worth, it is not a song I'm crazy about either. I mean, it's pleasant, and I don;t mind listening to it, but there are far better songs that I would much rather hear.) He keeps moaning about its popularity, which is not what you were talking about at all. And to think I was so tempted to write in my original comment that Baharon phool barsao only won because Shankar was notorious for buying up copies of the magazine and sending in votes for his songs. Can you imagine how ballistic that chap would have become if he had read that??? 1. With Lata: Agree absolutely. Sun mere saajna re is eternal, and one of their top five by any yardstick. 2. With Asha Bhosle: 'Husband's choice', now where is the argument? I like the song, but from OPN I would have chosen Bahut shukriya as Madhu has done. Overall, my choice would have been Deewana mastana hua dil or Chaand sa mukhada kyun sharmaya. 3. With Noorjehan: This is their only duet, and an outstanding song. But Rafi's first hit? These things are subjective. But even if you discard his Tera khilona toota baalak (Anmol Ghadi, 1946), his songs in Safar (1946), composed by C Ramchandra are well known. CR again in Saajan (1947) composed for Rafi Humko tumhara hi aasra (a solo version and a duet version with Lalita Deolkar), which was a roaring hit and an outstanding song. My guess is this film came before Jugnu. 3. With Geeta Dutt: Either Hum aapki aankhon mein or Udhar tum haseen ho idhar dil jawaan hai. 4. With Shamshad Begum: The song is very good. But I would invite you to listen to two duets in Chaandni Raat (1949) - Chheen ke dil kyun pher li aankhen and Kaise baje di ka sitar. 5. With Suman Kalyanpur: Very good song, but from Khayyam how about Thahariye hosh mein aa lun? A top class duet is Ae jaan-e-tamanna ae meri jaan-e-jaana (Jee Chaahta Hai). 6. With Manna Dey: Ye do diwaane dil ke from Johar Mehmood In Goa. Interesting discussion on Bahaaron phool barsaao. I coined a category for the song: "Songs that became a surprise sensation". Subodh was more frank (and he knows a good deal of music), and used a stronger expression. As for Binaca Geetmala, and Filmfare Awards, SJ won for Dil Apna Aur Preet Paraayi over Muhgal-e-Azam, and some nondescript score over Paakeezah, and some more of such kind, which became embarrassing for even SJ fans. What a beautiful post! Your anecdotes about this singing legend makes it a delightful read.There are some rare gems which I haven't heard before like "Hoke rocket pe sawaar","Gham ki andheri raat mein","Bheega bheega pyar ka sama ",thanks for providing links to such gems!My favorites from the above list are "Mama o mama","Yahan badla wafa ka","Nazneen bada rangeen hai vaada tera"," Aaj mausam ki masti mein gaaye pawan"(which you have mentioned above),"Do jasoos kare mehsoos ".It is always a pleasure to hear Rafi and Manna Dey sing together. But Rafi's first hit? These things are subjective. I will link the songs you listed, as soon as I can, so readers can have a few more songs. Thank you, Coolone. :) I'm glad you enjoyed the post. So many beautiful songs to choose from, no? From your list, the first three are absolute delights. and would definitely make my lists if I were to make separate lists of Rafi with different singers. Thanks for posting them. As usual wonderful post Anu. Like I mentioned in my comment on your previous post, I too never saw him without a smile on his face. Forget being serious or solemn, it was almost the smile was firmly pasted on his face. I would like to link to a long forgotten song, it is not a duet, it is a solo. It is from Shama and music director is Ghulam Mohammed, the song is really good and Rafi as usual is wonderful. Shilpi, thank you. You should write about your reminiscences on your blog as well, Shilpi. It is always interesting to read about personal interactions. And you would have met and known so many of them. Ghulam Mohammed was an underrated music director. By the time he came out of Naushad's shadow (wasn't he Naushad's assistant? ), and would have made a name for himself with Pakeezah, he died. :( Thank you for that link. What people like this (and you've had your share - more than your share, even!) seem to think that there can only be one opinion in this world, and that it must be theirs. Seriously. And the whole point of the thing is that Suraj as a whole got the award, not just Bahaaron phool barsaao. If I were asked to choose between the entire song list of Guide versus that of Suraj, I know which I'd pick. :-) By the way, Sathya Saran's book does mention that it was widely believed that SJ used to buy up copies of Filmfare and send in votes - in fact, the book mentions an anecdote where SD Burman did tell somebody that he wouldn't do something like that. I had thought of putting that into my reply to that Praveen character, then decided not to. No to reply, even. He doesn't deserve my time. ""Songs that became a surprise sensation". Very true! I've never been able to understand the love for Bahaaron phool barsaao either. It's pretty average, really. Was it BBC, a couple of years back, who did some sort of poll among UK resident NRIs and found that that was the song voted best ever Hindi film song? Surprised me no end. Madhu, too many people (music directors) have mentioned the tale of SJ buying up copies for it to be false. Apparently, Shankar (not Jaikishen, actually) was so focussed on being No.1 that he resorted to this. And as far as Sharda is concerned,didn't some music director allegedly say (paraphrased) I've heard love is blind, I didn't know it was also deaf.'? You always introduce me to new songs. Jidhar bhi dekhu is delightful! As is Jahan jahan khayal jaata hai. I have not even heard of the films they are from! They are my new favourites. Thank you so much for posting them here. I have heard Nashe mein hum before. Rather late in the day, I must confess. It was while I was researching songs for my Johnny Walker post. Loved his 'pomes', as always! Love your post, as always, too! I had never heard songs 12, 13, and 14 before today, and it was great to listen to Ankhon pe bharosa mat kar ... after what seems like ages! Ghum ki andheri raat mein ... has always been a favorite of mine, and Bheega bheega pyar ka sama ... too, but definitely not the video. It didn't matter in those days, when all we had was the radio, so I think we were better off, when we didn't see the video, and judged the song purely on whether or not it appealed to one's ears. I am waiting for the posts that are going to follow. Thank you, Lalitha. Glad to see you here. I agree with you about a lot of songs being aural pleasures only. :) Though Bheega bheega pyar ka sama is better than a lot of others, I must confess. I can never shake off the feeling that "Ankhon pe bharo sa mat kar" has some similarities to "Galop de Camargue" by Manitas de Plata. Manitas de Plata is one of the greatest flamenco guitarists ever though strict flamenco afficionados might cavil about that. He is also the father of Tonino Baliardo lead guitarist and co-composer of the French music group The Gypsy Kings. In the video below to the right you can see the moustachioed figure of Jose Reyes a wonderful flamenco singer who often accompanied Manitas de Plata. Reyes is of course the father of Francois and Andre Reyes who are the lead singers in the Gypsy Kings. The piece is beautiful. I'm not very good at spotting similarities, unless they are obvious. Yes he was Naushad's assistant, this song is from my father's film, during the making of which according to my mum, my father and Ghulam Mohammed developed a friendly relationship. As I read this post, I am listening to "Man chaahe Geet" on Vividh Bharati. And that sounds like a list of all my favourite Rafi songs as well. So I've officially given up all attempts to list "my favourite Rafi songs". Of course I cannot really say that I like only Rafi songs, I do love so many other songs too, but I think that when I am very old, quite past everything, I'll go back to Rafi and be carried away on a tide of Rafi, Rafi and more Rafi. Isn't that a lovely picture? Of course if I do live that long, chances are I'll end up a cantankerous, mean old lady, a really pain in the neck (and everywhere else) to all around me. But I honestly think that at my worst, a steady dose of Rafi will sweeten me up as nothing else. Anyway thanks for the wonderful post Anu. I would never dare to list my 'favourite' Rafi songs, Nalini. :) This list is but a representation of the various genres of songs that Rafi sang under various music directors. Like you, I like plenty of other songs and singers, but like true love, I keep coming back to Rafi. I'm glad you enjoyed this post. "Thahriye hosh me aa loon" was from film" Mohabbat Is Ko Kahete Hai". Thanks for that correction, Kaushik. AK doesn't usually make those mistakes.